A vital part of a visa or passport application is getting the photos just right, and meeting all the necessary requirements. In most cases, Embassies will tell you that the photos need to be passport-sized. However, this can cause some confusion, since each country has a different definition of what “passport-sized” means. However, if you are taking a Vietnamese passport photo or visa photo, then there is less to worry about, since the Vietnamese authorities are less strict than most when it comes to photos. There are still some rules that you will need to observe, though, in order to ensure your Vietnam visa or passport photo is accepted, and Reload Internet in Paddington, London, will be happy to help. We are located on Praed Street, only a 30 second walk from Paddington tube station and train station, and we stay open 7 days a week from early in the morning until late in the evening, allowing you to visit us at a time that suits you. We guarantee that the Vietnamese passport photo or visa photo we provide you with will pass at the Embassy of Vietnam along with your application when you submit it. A member of our staff will capture your photograph using the correct background & lighting and will then ensure that it meets all of the necessary criteria in regards to Vietnamese passport and visa photographs. 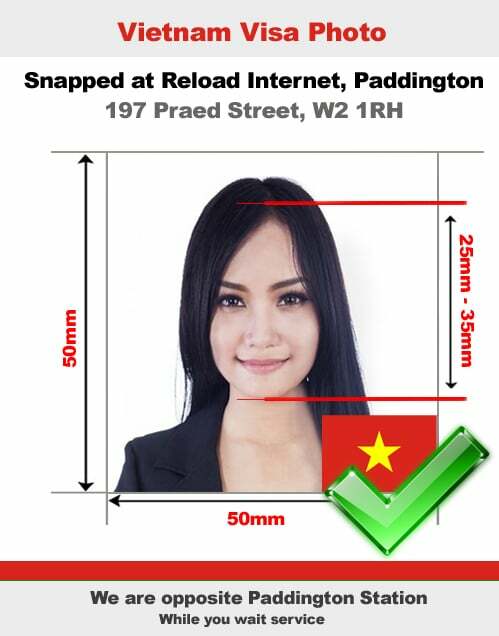 After guaranteeing that it will pass, we will print your photographs using Embassy approved passport photo printers and cut them to the exact sizing required by the Embassy of Vietnam. Your Vietnamese passport photo or visa photo must meet the requirements stated below, otherwise your application will likely be rejected when you submit it to the Embassy. You must maintain a neutral expression in the photo- no frowning or smiling. Your photos need to reflect your current appearance, which means they should be taken as recently as possible. Preferably, they should be taken within 6 months of making your application. Photos should be taken against a plain white background, and printed on high-quality white photo paper. You are not permitted to wear glasses while the photo is being taken. Headwear and scarves are prohibited while the photo is taken. The same thing goes for any other accessories that cover your ears or forehead. Your whole face must be clear, visible, and in focus on the photographs that you submit with your application. Your eyes need to be fully open and visible, and you need to look straight at the camera. You can wear prescription glasses, so long as the frames are not too thick, the lenses are clear and non-tinted, and there is no glare or reflection on the lenses. You must not smile while the photo is being taken, and your mouth must remain fully closed. Your application should include two photos printed on high-quality, glossy photo paper. The lighting in the photo should be even, as there cannot be any shadows visible in the photo. You should not wear hats or other headwear in the photo. The only exception to this is headwear for religious or medical reasons- however; this cannot obstruct your facial features at all. No other person may be visible in the photo- this includes hands used to support the child, which is the main reason why infant photos are rejected by the Vietnamese authorities. No toys, pacifiers, or other objects should be visible in the photo. Photos must be taken against a plain white background. The child’s head should be as level as possible, and they need to have their eyes open in the picture. Other than this, the same requirements as stated above still apply. As mentioned above, Vietnamese officials are less strict about visa and passport photo requirements than other countries, which means taking your photo is a little easier. Although there are fewer regulations when it comes to how you should pose in the photo, it’s still a good idea to follow the guidelines put in place by other countries. A rejected application could mean you have to delay your trip to Vietnam, which will wind up costing you more money than if you had simply had the photo taken professionally in the first place. For this reason, it is best to visit a professional passport photo studio to have your Vietnamese passport photo or visa photo captured and printed. Our specifications are received from the Embassy of Vietnam’s official guidelines on passport and visa photos, which you are able to see here.